The MB Orchestra returns to Dahlak with an Egyptian dance party. 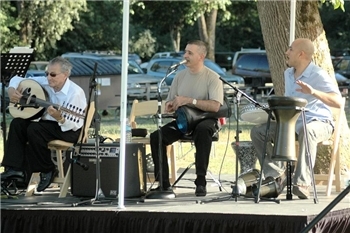 The Egyptian ensemble features brothers Bahaa Sadak, vocalist and keyboards, George Sadak, drummer and percussionist, and their father, oud master Maurice Rouman. A family group, MB Orchestra plays a mix of Middle Eastern music, alternating between the passion of ancient Egyptian Pharoanic music and the enticing sounds of a modern Cairo cabaret. This entry was posted in Uncategorized and tagged Middle Eastern Music. Bookmark the permalink.